This Saturday (Sept. 19th), I'll be at the Windy City comic con with fellow South East-Michigan pals Jeremy Bastian & Katie Cook. Because this is a one day show, I will be doing free quick doodles for anyone who has a Mouse Guard hardcover or their own sketchbook for me to do it in. At the Long Beach Con (Oct 2-4), I'll be signing an all-new, exclusive Mouse Guard print, with an image created specifically for Long Beach Comic Con. Available only at the Atomic Apple booth. Limited to 25 pieces per day (75 total). I'm pretty happy with how this turned out. Careful readers/fans may be able to figure out both the mouse and location featured (though it will take some extrapolation)...though if you do, there is no prize this time. I will be attending this year's Big Apple Con (Oct 16-18). This was a last minute addition for my schedule, but as my next NYC show wouldn't be until fall of '10 (which at best I'll only make 1 day of), it is a trip I felt was needed. Thanks to Peter Katz for making the arrangements! This week's Fan Art comes from Dominic Bercier. I met Dominic about a year ago at Baltimore and he had some cool sample pieces to show off. 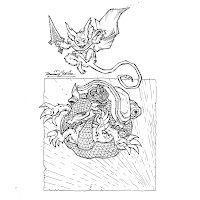 He just sent this Mouse Guard piece a few weeks ago, Thanks Dominic! Congrats on week six David! Has anyone found the easter egg in the pile of bones yet? may the force be with you! LOL when I found it! Only the mouse and location are recognizeable...don't hunt for a duck. Nice meeting you at the convention David, and VERY COOL to see the color version of that Kenzie ice cave illustration. Of course I had a ton of questions come to mind after I left, but that's ok. Again, looking forward to the Black Axe series.